Any aspiring shark-cage divers in the house in need of a tiny nudge or some practical information? Well, Meisha Mustak – who’s one of our Getaway Consultants – re-emerges after-hours as an adventurer who – by her own admission – will try most things at least once. Her latest escapade was a shark cage dive, and so we asked her to give us the heads-up. 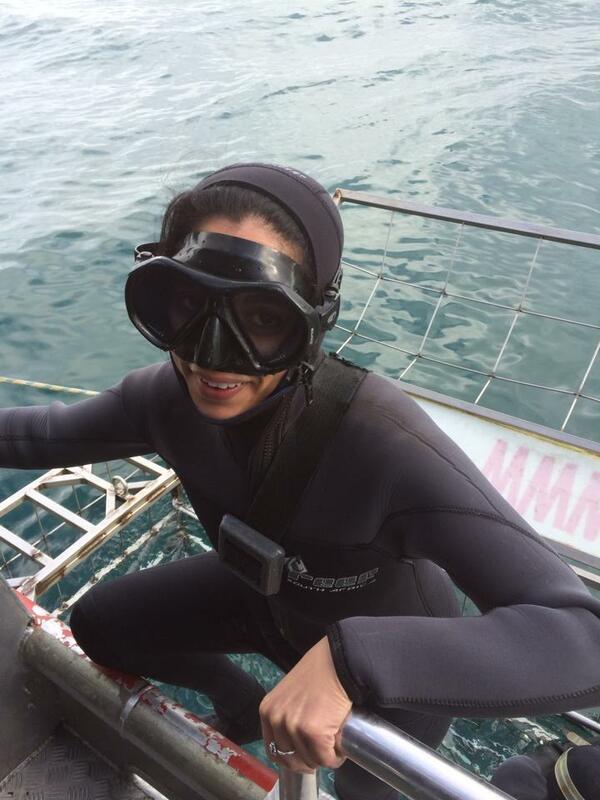 Exclusive Getaways: You recently had the exciting adventure, Meisha, of shark cage diving. What are 3 words that best describe it? Meisha: nervous (just a bit), exciting & cold! Exclusive Getaways: What drew you to do this adventure? Meisha: It was unplanned, actually, but happened spontaneously when my cousins were out here from Canada, with shark-cage diving at the top of their bucket list. They asked me to join in, and so I did. Exclusive Getaways: How long were you actually in the cage & what did you see? Meisha: 15-20 minutes, though at some points it felt like much longer, especially whilst waiting for sharks to come by. We saw lots of fish, and of course, we also saw sharks moving through the water. They come fairly close to the cage and then swim past. Luckily they didn’t make eye contact! Exclusive Getaways: You went to Gansbaai for the adventure. Would you recommend it as a great area for shark cage diving? Meisha: Yes, it’s a great place for viewing sharks. We went with Marine Dynamics, and they have a marine biologist on board who provides really interesting information. Exclusive Getaways: What was most surprising about the adventure? Meisha: I was most surprised that once in the cage, I felt very safe and unthreatened. Exclusive Getaways: Could you say more about safety aspects? 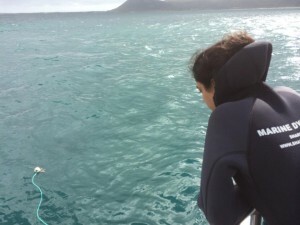 Meisha: The cage is held by a crane on the boat and lowered to just below the surface. It feels very secure and firmly held by the crane, and what also helps is that you are lowered just beneath the surface, so you could easily signal if you wanted to come out of the water. Exclusive Getaways: Was it the big adrenalin rush we imagine it to be? Meisha: Well, I would probably rate rock climbing as being more of an adrenalin-charged adventure than shark cage diving. Exclusive Getaways: Who would recommend the experience to? Exclusive Getaways: Are there any categories of people you would advise not to do it? Meisha: People who are generally quite anxious would probably not enjoy it, and people who experience claustrophobia. Exclusive Getaways: Would you do it again? Exclusive Getaways: What’s next on your adventure bucket list? Meisha: I could have my arm twisted to do a few things, really. Gliding, perhaps …? Exclusive Getaways: Where would you recommend people stay if they’re going to Gansbaai to shark cage dive? 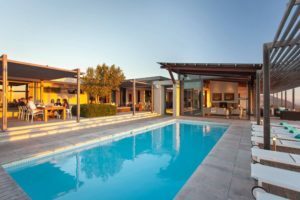 Meisha: A fabulous place to stay near Gansbaai is the Grootbos Private Nature Reserve. There’s really a lot to do there for nature-lovers, including shark cage diving. 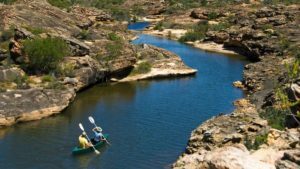 Other activities include fantastic cave and beach walks with Grootbos guides, walks through forests of old Milkwood trees, horse riding, fynbos drives, and boat trips. It’s almost whale season, one of the seasonal highlights at Grootbos. The lodge is positioned up on a hillside and overlooks Walker Bay, which is visited by whales each year. On the boat trips, you get much closer to whales, and you also see other marine life. It’s a fabulous marine safari! The accommodation is most wonderful, whether you choose to stay at Garden Lodge or Forest Lodge, and the food is truly exceptional.